Hello friends – thank you so much for joining me today! My name is Shannon Lane, and I’m a member of the 2017 Stampin’ Up! Artisan Design Team. 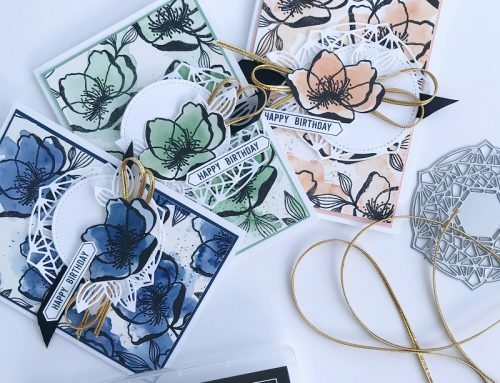 I’m thrilled to be guest-blogging with SCT today, and so excited to share one of my favourite new stamp sets – Message In A Bottle – and some beautiful new Designer Series Paper (DSP), called Naturally Eclectic. My son was recently invited to an end-of-school pool party, and it’s been all he could talk about for a week – when I sat down to create this project, that pool party was on my mind and this sweet stamp set was a perfect fit. How cute and easy would it be to use Message In A Bottle to create an invitation and some party decor for a summer party? We needed an invitation to start, of course. I cut up a piece of the gorgeous Naturally Eclectic DSP for this beautiful faux-watercolour background. It reminds me of the sea, so a frosted glass bottle and some whales came along for the ride. Party favours are fun – these adorable Clear Tiny Treat Boxes from Stampin’ Up! 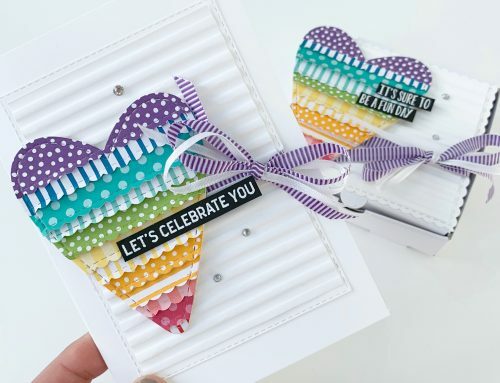 are quickly and easily embellished to fit the theme using DSP, ribbon, and stamped images – don’t you love that little octopus? And you know what they say – a party without cake is just a meeting! Cupcakes are extra special with a mermaid topper. 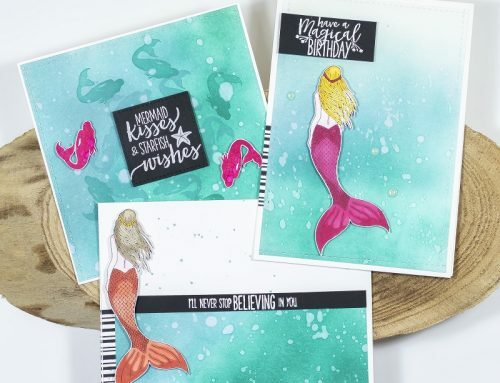 I love that I can create mermaids of different hair and skin tones using my Stampin’ Up! Classic Stampin’ Pads and a Blender Pen. Wouldn’t it be adorable to match the mermaids to the birthday girl, or create one to look like each of her friends? Shannon, these projects are so darling and the perfect party decor! Thank you so much for sharing your beautiful artwork with us! To see more of Shannon's beautiful work, be sure to click on her name above! We love our friends at Stampin' Up! and they certainly love our readers! Today Stampin' Up! has another wonderful giveaway for one lucky reader that includes the Message In A Bottle stamp set and the new Designer Series Paper Naturally Eclectic. For an opportunity to win these fabulous products, be sure to leave a comment below by July 30th! Good luck! A winner will be announced in our next Stampin' Up! post on August 5th! Congratulations Rosemarie! Please send us your mailing information, including your telephone number, to ideas@scrapbookandcards.com and we will send it off to Stampin' Up! Thank you again to Shannon and to all of you for joining us on this fine Stampin' Up! Saturday! If you click "Stampin' Up! Saturday" in the sidebar you'll see all the amazing posts our friends from Stampin' Up! have shared with us! This stamp set is adorable! Love the mermaid! It is such a versatile set and the paper works well with it. Who wouldn’t love this as an addition to their craft stash! Cute ideas for a pool party! Wow, Shannon, you did an awesome job with this set. What a great way to celebrate. Thanks for the inspiration. These projects are so adorable. I love that this stamp set has a little bit for everyone. My daughter is obsessed with mermaids at the moment, and she would be over the moon to use that cute stamp. My son loves every kind of vehicle, and that ship would totally “float his boat” (haha–see what I did there? ::wink::). I would love to win this set of products!! How cool! I love the Eclectic Floral papers and Sharon’s cute project usin the cute creation ideas, congratulations to Renee on her win! Enjoy your new goodies! TFS! These projects are perfect for summer fun!This is one of the most versatile summer stamp sets I’ve seen, sure would be fun to win and use! Wonderful stamp set & great summertime ideas. What a wonderful party celebration! Love this set! so much for the chance to win this! What fun projects you have made with this set! Definitely water and mermaids come to mind with the beautiful colours that you chose! Very unique and well done! Would love to win the stamp set and paper, as it has been on my wish list!!! This is an example of the stamp set you are not sure of until you see someone make great projects with it. Thank you for helping me see these stamps’ potential. And I love the paper. Such cute projects! Thank you for sharing 🙂 That stamp set is adorable and the DSP is very pretty!!! Thanks for the chance to win some of this SU! goodness. 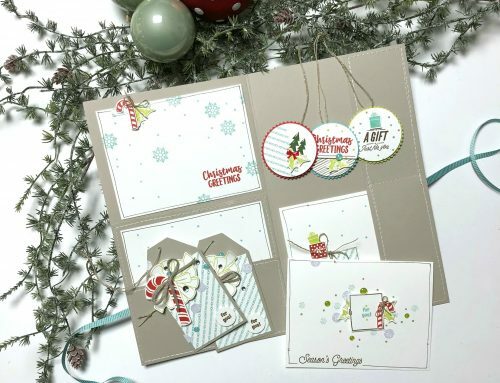 That’s some very stunning paper and the stamp set is SO cute and versatile ! Would love to try it as a shaker card ! These stamps and the sentiments are so adorable! I love everything nautical and these stamps would be awesome to add to my collection! Have a wonderful weekend everyone! The Naturally Eclectic paper is gorgeous and how fun that Shannon paired it with Message in a Bottle! Cute, cute, cute! Fun paper and stamps! I especially love the stamp that says, “If I told you once…” I can hear my mother’s voice! Thanks, Shannon! The tags and toppers are adorable! So fun and summery. What a cute stamp set. Nice use for a summer pool or beach party. Great Stampin Up stamp set and papers. I can think of all sorts of projects to use these with. Thanks for the chance to win awesome SU blog candy! The ideas are always so great on these Stampin’ Up posts! I especially enjoy seeing party projects. Thanks for the fun giveaway. Those papers are gorgeous and as for those stamps … WOW! words fail me, I can see so many different uses for them, not least on beach themed scrapbook pages which I hoping to grab photos for this summer. Good luck to everyone who enters. I love the message in a bottle. Such a different twist. Oh my goodness!!! Such adorable stamp set!!! I’m totally in love for all these cutie creations!!! What a cute stamp set that is right on trend but so original. I teally like the addition of the bottle- so many possibilities. This is a great set to use for scrapping my kids mini-golf pictures- the place is pirate themed! Oh My what a cute stamp set this is and the paper is just gorgeous. I agree what beautiful cards, invitations and cake toppers they make. Thank you for sharing. I love that gorgeous paper! 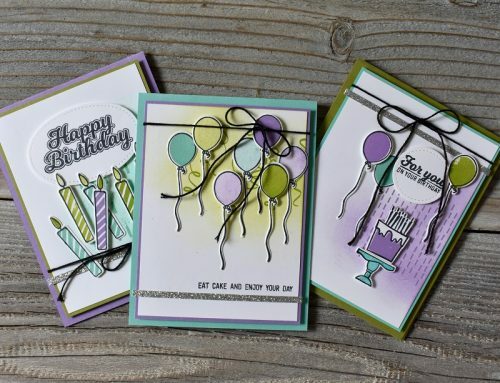 Stampin’ Up has fantastic products! Oh, I don’t think that stamp set could get any cuter!!!!! Adorable stamp set with fun sentiments. All things ocean! Love it! The bottle with so many choices to fill it is great. Thank you for the chance to win. Cute stamp set and just perfect for any water themed event. Love your party projects. Thanks for sharing and the chance to win. What adorable projects from such a versatile stamp set. The mermaid with the little sailor cap is adorable. Love the colours and patterns of the designer paper. What lovely projects you made Shannon. I just adore the sweet message in a bottle set and such lovely papers. Just love the mermaid topper on the cupcakes. Would love to make these for a party. Great stamp set for making invitations also. Love the bottle and love you message. Such a wonderful stamp set and the paper is really pretty. Both are so versatile for so many projects! Thanks a bunch for a chance to win them!!! Love those cupcake toppers! So fun! What a cute stamp set! The mermaid cupcake toppers are so cute! The new paper is lovely too. Adorable stamp set….is so perfect for summertime activities! What adorable ideas! This stamp set is cute, cute! I love the stamp set, it seems so fun. Thanks to Stampin’ Up and SCT for the chance to win. Awesome stamps and projects. LOVE this set. I have a passion for nautical stamps. So very nicely done! Oh my, so adorable! Gotta look for this set as it would be perfect for the birthday party that I’m hosting later this summer. Thanks for sharing this cute giveaway! Love this stamp set! Love how everything works in the bottle. Thanks for the chance to win! I love any ocean stamp sets and these are adorable and I can see so many applications for them! The projects are so cute and will make for a very happy group of little munchkins. Thanks for sharing. These projects are so fun and summery! Nautical and under the sea themes are always so trendy and this set looks great. Would love this set. Thanks for the chance! Ooooh, pretty paper. Thanks for the opportunity to win. Oh my goodness! This is such a cute stamp set and I love the mermaid and sea creatures. My two little girls would love this set as well, and I can think of so many ways to use it. Thanks for the chance to win. Pretty papers and adorable stamps…make this a fabulous giveaway! I love Stampin Up products already, but this Message in a Bottle set couldn’t be cuter. Thanks for a chance to win this! What a cute stamp set! Love how all of these projects show off its versatility! oh the fun we (my daughter and I) could have with this stamp set!! Thank you for the chance! I love this stamp set- SO much fun! And lovely papers to go with it! Thanks for the chance! I LOVE THIS STAMP SET, in fact, it is one of my all time favorite SU sets! Someone was very clever when coming up with this set. The ship in a bottle reminds me of my trip to Boston. Thank you so much for the giveaway, I am in love with the papers! What a treat this post is, thanks for sharing. Everything about it, the projects, the cupcakes, the SU yummy gift, screams of summer, fun, sun , family time. Looove it. Cheers! I love this set… It totally “floats my boat” and has been “octopi-ing my thoughts”… “A lot!” I am sure all the SCT readers will “get the message?”… This set is sure to “make a splash” for someone who will yell, “whale, hello there” with this happy mail! Thanks for a chance to win and good luck to all!! Super cute stamp set. I mean who doesn’t love a cute little mermaid. I love the projects Shannon did with this set. I would love to win this prize and share it with my granddaughter. Thanks for the chance! Such great projects! I especially love the party favors. The stamp set is really cute and so versatile. Thanks for the chance to win this awesome Stampin Up giveaway! such a cute set of projects, love! I love the paper! And octopi are my favorite. Cute, cute, cute set. Thanks for the ideas. What an awesome stamp set. Love all the twisty octopuses. The paper looks like it would be fun to play with too! Love the mermaid nautical theme. Very lovely paper and the stamps are wonderful. Mermaid is so cute. Love the mermaid and octopus. And the DSP…. those colors just pop. Love Stampin’ UP! You should include the cupcakes in the giveaway. My Mother could have used the ‘If I told you once’ stamp when we were growing up. So many possibilities with this stamp set.